This is a guest post by Catherine Jones . If you want to guest post on this blog, check out the guidelines here. Facebook features are normally well received and loved by its users, but one feature name ”Poke” always remain a matter a debate. A clear use of it was never known and found and I think even Facebook doesn’t even know what a Poke means, with the Help page reading: “The poke feature can be used for a variety of things on Facebook. Like you can poke your friends or even other people not present in your friend list to say hello.” It can express either a simple “hi”, or flirting. I originally thought that Poking was merely flirting or trying to draw attention: A subtle way to grab the attention of another Facebook user. But now Facebook has gone ahead and done a halfhearted attempt step and hidden “the poke” from the Facebook page. Wish they had completely removed it. With the launch of new Facebook subscribe button, they have hidden the hugely unpopular and seldom used “Poke” button behind the settings menu, so that visitors to your profile page will not be able see it. But see the irony: Facebook users didn’t even notice it. In their criticism of the new Facebook real-time “Ticker” at the right side of the page very few eagle eyed facebook users noticed that the Poke button had virtually been removed. The best part is: With the latest Facebook’s redesign (some appreciated and some not) will keep the Poke button permanently behind this dropdown menu — with other options like: suggest friends and report/block profile. Facebook has no plans to make it visible again. In my opinion there are some other better options than Poke in Facebook to convey your message across. One can send a message to them or can post on their wall ad with Subscribe button; the Poke feature has lost its usability and reason of existence. Catherine Jones writes for http://www.marinadelreytoyota.com. She enjoys content and writing about the social sphere. 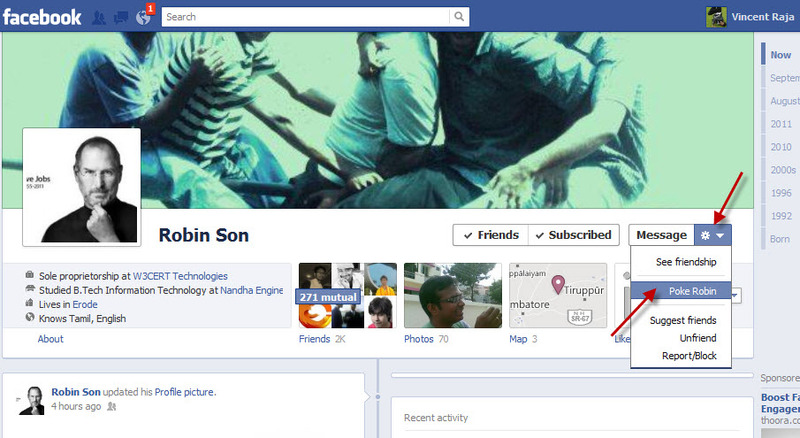 The recent customizations facebook has come out with are quite brilliant. The poke button was pretty much a useless thing and its good they have hidden it. they should remove it completely !!! Strictly aesthetically speaking, it all looks nice. Although, there are apparently some kinks in the functionality. Also, if they hide the poke button to downplay the feature, why did they make it a notification when you receive one?